The rings are being pulled into Saturn by gravity as a dusty rain of ice particles under the influence of Saturn’s magnetic field. NEW RESEARCH FROM Nasa has confirmed that Saturn is losing its rings at the “worst-case scenario” rate. The research shows that the planet is losing rings at the maximum rate estimated from Voyager 1 and 2 spacecraft observations made decades ago. James O’Donoghue – from NASA’s Goddard Space Flight Center in Greenbelt, USA – said that the rate of the “ring drain” takes enough water products to fill an Olympic sized swimming pool in half and hour. “From this alone, the entire ring system will be gone in 300 million years, but add to this the Cassini-spacecraft measured ring-material detected falling into Saturn’s equator, and the rings have less than 100 million years to live,” he said. This is relatively short, compared to Saturn’s age of over 4 billion years. O’Donoghue is the lead author of a study on Saturn’s rings released yesterday. The research points to the fact that the rings were acquired by the planet later in life, rather than it being formed with them. “We are lucky to be around to see Saturn’s ring system, which appears to be in the middle of its lifetime,” O’Donoghue said. However, if rings are temporary, perhaps we just missed out on seeing giant ring systems of Jupiter, Uranus and Neptune, which have only thin ringlets today. There are a number of theories around how Saturn got its rings. One such theory is that they formed later in life when small, icy moons in orbit around the planet collided. 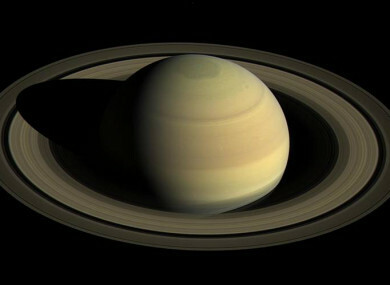 Email “Saturn is losing its rings at the 'worst-case scenario' rate”. Feedback on “Saturn is losing its rings at the 'worst-case scenario' rate”.